The Royal Canadian Mint is one of the the world's most prominent precious metals refinery. The mint produces a number of highly popular products, including the Canadian Maple Leaf coin series, which is avaialble in gold, silver, platinum and palladium, and the 99999 fine special edition maple leaf gold coin. The RCM also produce gold and silver bars. RCM silver bars are manufactured for silver investors, not collectors. Therefore, they are only available in larger sizes. 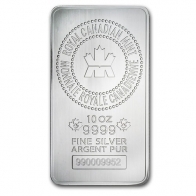 The most popular sizes for the RCM silver bars are 10 ounce and 100 ounce bars. 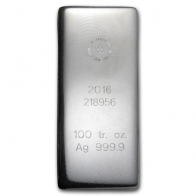 Unlike almost all other silver bars available in the market, RCM silver bars contain a higher fineness of silver at 9999. Royal Canadian Mint silver bars are available for VAT-exempt Swiss storage, which is free for up to one year. Clients may request delivery or sell their holdings back at favorable rates at any time. 2019 © SB Asset Management Limited. All rights reserved.